Extreme cold? Check. Acid rain? Check. So why do locals love the Arctic city of Norilsk? Flying home over the years I have often been blown off-course and forced to land in another Siberian town. On my most recent trip it happened again. An hour before we were due to touch down at Alykel airport, our captain announced that the plane would be landing further south in Nizhnevartovsk instead. I didn’t mind: it was only about an hour’s delay. The airport was clean and new. At the start of the Noughties an acquaintance of mine had to spend two days in the old military airport in Raduzhny, where the arrival and departure lounges were in the same dilapidated wooden bunkhouse. I don’t know if the airfield is still there — but even if it isn’t, you can still have any number of adventures on the way to Norilsk. In the middle of the last century, Norilsk was known as the “City of Brawn”. You couldn’t go there unless you were specially invited, like the gritty and fearless workers hailed as “builders of Communism”. Besides space, the Extreme North represented the last unexplored zone for Soviet-era Russians. Visiting it became a dream for many children in the 1960s — including the two people who would become my parents. But it wasn’t just romantic notions that brought Russians to the sub-Arctic. They were lured there by three things that made even the inhospitable conditions tolerable: a living allowance, generous rewards for hard work, and an abundant supply of goods. Thanks to their high northern wages, miners could afford to fly to Moscow every weekend if they wanted to; smiles spread over my parents’ faces when they reminisce about how their local supermarkets were overflowing with sweetened milk, while you could hardly find a block of margarine in the rest of the Soviet Union. 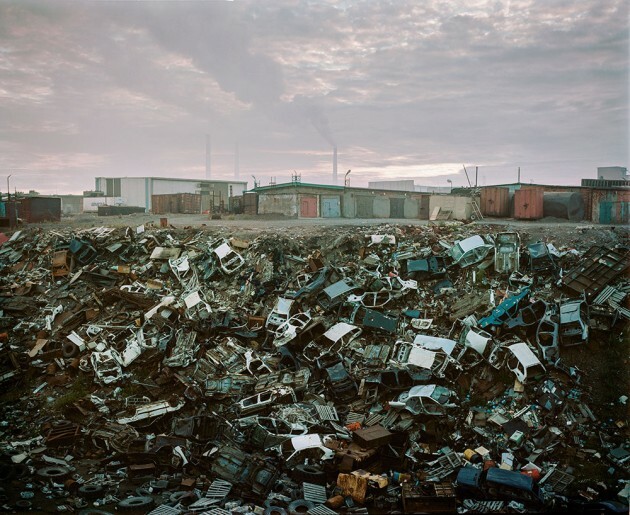 Today, Norilsk is the second-worst city on the planet, environmentally speaking. Because of the high concentration of copper and other elements in the atmosphere, its 200,000 inhabitants have dark, toxic clouds constantly dumped on them. Add to this a permanent biting wind, and a winter that spans almost ten months of the year. It is hard to imagine a worse place to live. As the plane begins its descent, I gaze, anxiously, at the familiar forest tundra below, bathed in the light of a cold sun. Beyond the tundra is the Putorana Plateau, an emerald-green expanse, with a million shimmering streamlets running through it. It looks like an old mirror covered in moss. Running through it is the Yenisei river which divides Siberia into its western and eastern parts. 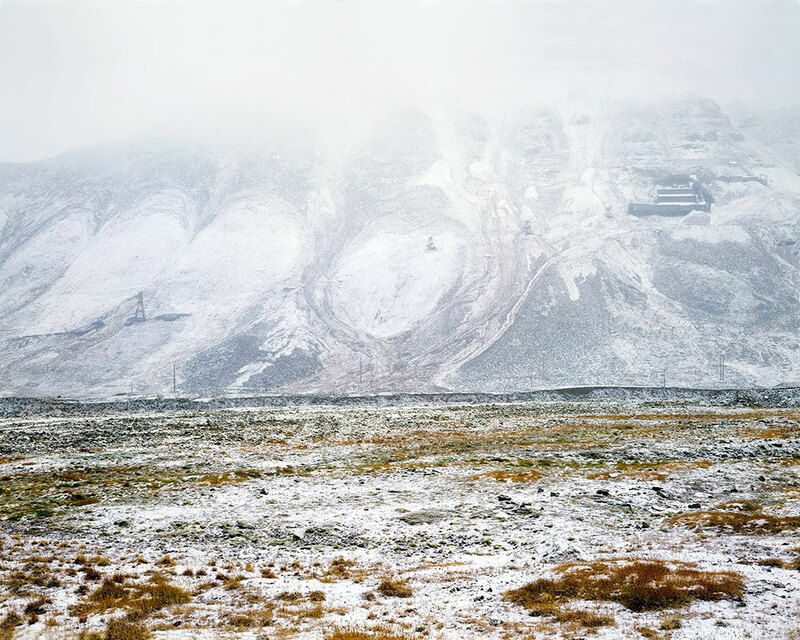 Norilsk lies in an endless valley, close to where the Yenisei drips into the frozen Arctic Sea. For the two months when it’s not cold, a real northern summer comes to the towns of Siberia. It doesn’t last long, but it’s hot, almost 30 degrees. The locals take kayaks onto the violent rapids of the Kharelakh river. They fill baskets with bittersweet orange cloudberries and sunbathe in their employer’s decrepit campsites. That is, of course, if they haven’t travelled to the “mainland” — which is how the people of Norilsk describe any town further south that you need an aeroplane to get to. It’s the middle of November when I land in my childhood home. My timing is perfect. I have missed the early autumn mudslides when for several weeks the mix of dirty snow and rain on the streets ruins any new boots you’re foolhardy enough to wear. And Norilsk won’t be engulfed by the three-month Polar Night until the end of the month. Alykel airport is windy, but in the town itself the buildings shelter you from it. It is 40 degrees below freezing but the air is dry, so it is easier to bear than a damp -10C in Moscow. I cover my face with a glove and run to look for a taxi driver to haggle with. While the engine warms up we exchange small talk, about the slow internet and exorbitant price of goods. I look out of the window, at the old train tracks (laid in the 1960s and now bent by the cold), and at the primitive snow barricades, designed by an engineer called Popov — a prisoner here in one of the northernmost labour camps in Stalinist Russia. In the 60 years since he invented them no-one has thought of a better way to keep snow off the roads. We drive past the satellite town of Kaierkan (which means either Forbidden Place or Death Valley), leaving behind the Nadezhdinsky metallurgy plant. The word Nadezhda — “Hope” — above the entrance is crossed out, making for a poignant image. Forty minutes later the taxi arrives in Norilsk. The first thing I see is rows of housing blocks painted in pastel colours; this is to save their inhabitants from “colour blindness” — the lack of any colour at all during the monochrome winter. Leninsky Prospekt leads from Metallurgists’ Square to Oktyabrskaya Square, where a stone Lenin greets workers coming home from the industrial zone. The entire history of Soviet urbanism can be viewed along this two-kilometre strip. We really are going back in time: the panelled monsters of the 1970s give way to five-storey Khrushchev-era blocks, which in turn give way to Stalinist buildings. Next to this, the first buildings of the “new” Norilsk look like a study in classicism. This is especially noticeable on the lovingly-curated Gvardeiskaya Square, which ever-so-slightly resembles St Petersburg. Next to the square is the enormous Norilsk Project — a multi-purpose institute dedicated to metallurgy technologies. The orange and black “Norilskproekt” display, showing the time and temperature, is the town’s calling card. It has orange digits: -50C/14:32, shining through the polar frost. The other symbol of the town — a little way from here, across Dolgy Lake, right opposite my old school — harks from the grotesque story of Norilsk’s beginnings. At the foot of Mount Schmidtikha stand rows of simple wooden crosses and a small chapel. Under the black slag heaps lie the bones of the thousands imprisoned in the Norilag, the polar Gulag. Discardedunder metres of ice, the corpses haven’t decomposed. They still call this place Golgotha. In Norilsk it’s hard to separate myth from reality. The elderly population speak of a time during the 1960s when the town had a yacht club. In the 1970s herds of deer from the Taiga used to gallop down Leninsky Prospect. At around that time a well-known naturalist, Ledovsky, kept an orphaned polar bear cub called Aika in his apartment and lived with her for a whole year. In Norilsk they built greenhouses and grew vegetables. In Norilsk the Soviet architect Shipkov planned to build a huge glass dome and plant cedar trees in the Arctic Circle. Some of Norilsk’s myths are true. Sometimes when my schoolyard was buried under snow, I had to clamber into my classroom through the window. We would leave through special tunnels dug under the snowdrift. In February we swam in Dolgy Lake. The town’s heating pipes pass through it, so the water gets to a balmy 15 degrees. We used to use Popov’s snow-breakers as rafts. And in summer, if there are storms, you can ride the wind: stand with your back to the storm, run until you’re ready to take off, then jump off buildings into the snow from a good 5 to 7 metres. Base jumping, polar-style. The people of Norilsk are honest, and kind to each other, as inhabitants of the North often tend to be. It makes life easier. In Norilsk strangers often cross the road holding hands. They have to — it really is that windy. The last time I felt this collective strength was during my final year in Norilsk before leaving home. For the last few days the Black Blizzard had been terrorising the town. The wind rose to 40 metres a second. You couldn’t see past the end of your nose. Roads were swallowed up by snow. Stores ran out of Danone yoghurt, so we started on a detox diet of fermented milk from the local dairy plant. It is the last day of the blizzard that I remember best of all. Friends from nearby Talnakh had been staying with us. They couldn’t get home: the snowstorm was too severe for buses to leave the town. But today the roads were supposed to be opening again. Our friends packed their bags and I took them to the station. The wind had died down. Kids had reclaimed the snow-covered streets: toboggans, snowball fights, snowmen. But there was still no electricity at the station, so we searched for their bus in a darkness filled by a boisterous crowd. After waiting for an hour or so a guitar appeared from somewhere, and we began to sing. As we sung, my whole life flashed in front of my eyes, like a scene from a movie. How we used to go ice-skating in deserted factories. How we grilled shashlyks at -40C. How a friend melted his new trainers when he fell asleep with his feet up on a radiator. How we took the bus to warehouse raves in Talnakh. How my mum used to drag me to school in my first year, as the flaming aurora of the Northern Lights flowed above us and Venus shone at the corner of the sky. Every one of my friends who has left this place dreams of returning — to the place where they used to kick balls of crisp snow into your face, and where homes buzzed with gas lamps and the howling wind. But I knew that, as much as I loved this town, it was time to move on.